The Mind of a Helmet Camera Cyclist: Humble Pie and Downright Lie? Humble Pie and Downright Lie? I have an apology to make. Quite a significant one. One of my previous blogs was entirely mis-representative. This one. Even the title, "Failed by the police" is completely wrong. I was not failed by the police. Thus, I would like to apologise unreservedly to Police Scotland and to the police officers that I anonymously implicated. I am sorry. Police Scotland did not mess up on this occasion. That was completely false. 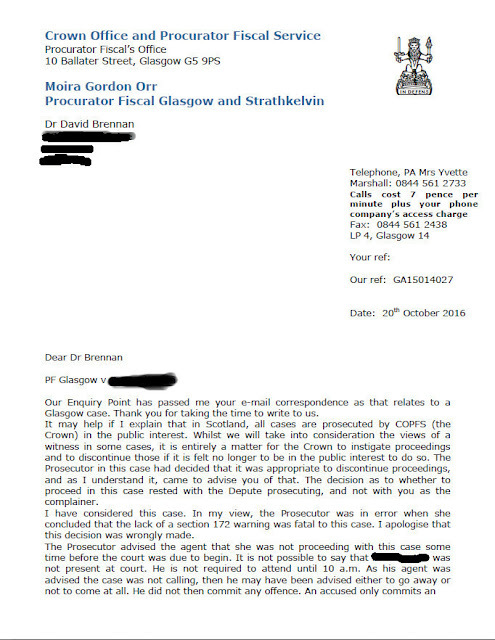 My accusation, which was based on a conversation I had with a Procurator Fiscal, was that the police had messed up their procedures and hadn't applied a section 172, which requires a driver to identify him or herself when requested by the police. There was no issue with the 172. Let me explain. As I discussed in the above linked blog, I attended court for an incident where a van driver had (in my educated opinion) swerved his vehicle at me, whilst hitting his horn in anger. This forced me to swerve into another lane, which was fortunately empty. Here is the video. I think you will agree that this was a seriously bad piece of driving. That bit was a bit strange, and only in hindsight does this make sense. Well, actually, even then it doesn't. Why ask me what I want to do? Anyway I agreed that if there was no prospect of prosecution, that there was no point. So I agreed that the case should be dropped. I then went home, angry with the police, and wrote the angry blog. 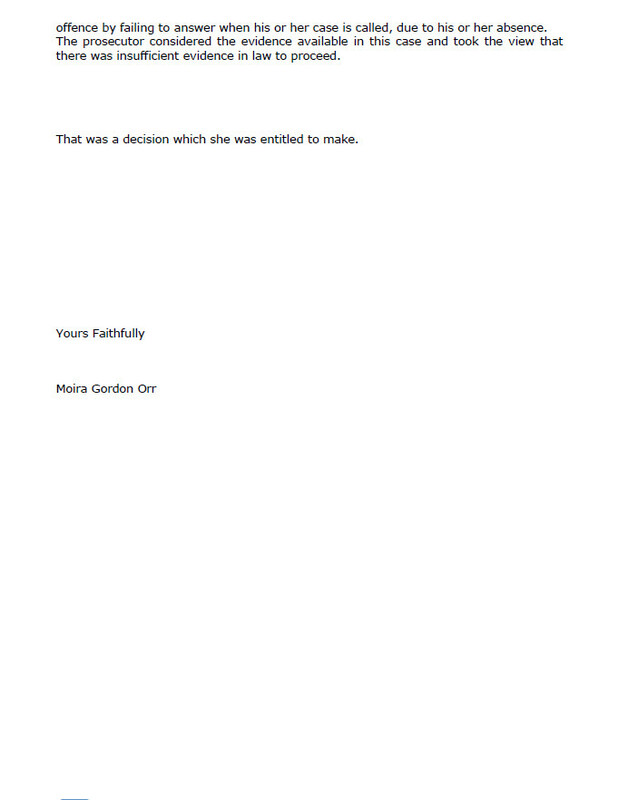 I wanted to make a formal complaint so I started writing that. At the same time I spoke to Herald reporter (Helen McArdale) who at the time was transport correspondent. She took an interest and suggested that she would do her own investigating. I left her to it, expecting to have my story confirmed. Then I got an interesting reply from Helen. The police got back to Helen and categorically denied that there was any issue with the section 172. They suggested that the section 172 had no bearing on the case being dropped. Strange. Very strange. I expected that the PF would counter that suggestion. I expected that there was some form of miscommunication and that there was indeed a problem with the 172. It turns out they didn't and there wasn't. This was the quote from the PF that came shortly afterwards via Helen. .... the Section 172 had "no bearing" on the decision to drop proceedings in this case - .....the issue of establishing the identity of the driver wasn't an issue and he had provided details. The decision to drop the case was down to "other factors" and not related to any problems on the police side. The PF (young lady) who took me out of the witness room was quite clear that the issue in the case was down to the section 172. In fact I remember seeing the notes in front of her and it had a 'post it' note on the notes for my case. It clearly said 's.172' on it. She specifically took me outside the witness room to discuss this, and told me that on this basis she could proceed with the case, but that as soon as the prosecution stood up they would call for the trial to be stopped. They would highlight the issue with the section 172 and the Magistrate would have no option but to drop the case. She pointed out that it could proceed, but would ultimately fail, and thus wasn't worth it for the strain I would be put through (she pointed out that they knew I posted on YouTube and that this would probably be used against me). On this basis she asked me.... did I wan't to proceed? I thought that this was a little unusual, to be asked this, but thought she was just being nice, as the only obvious answer was.... not to proceed. I left very angry, as you can imagine. I was angry then, having heard the PF's latest response I was furious!! Oh and one more thing.....The Sheriff court suggested that the accused was absent from court that day. I was recently a witness in a case against xxxx xxxxx. On the 28th September I attended court. Whilst I was there I was called outside by the Procurator Fiscal working on the case. She told me that unfortunately, due to a police error, the case was unwinnable. She pointed out that the police failed to process a section 172, and thus the identity of the driver, whilst know, could not be proven in court. She then suggested that the case could go ahead however, as soon as the defence lawyer stood up, he/she would call for the case to be dismissed on these grounds and would succeed. She then asked if I wanted to proceed. She pointed out that if I did, it would not be a nice experience as the defence lawyer knew I posted videos on Youtube and would use these against me. I decided, based on this information to allow her to drop the case. I commented that there was no point wasting my time on something that can't succeed as I have a lot of work to do. She then made a comment about having lots of other cases to prosecute that day. She seemed relieved. There were no issues with a section 172. Both the PF and police have confirmed this. There were no issues in identifying the accused for the purposes of the trial. The accused apparently was absent on the day of the trial. The local Sheriff has confirmed this. Understandably, I am very concerned by this, as I only agreed not to proceed (I was surprised at being asked!) due to the particular issue surrounding the S.172. In fact I explicitly remember seeing a sticky note on her notes with S.172 written on it. There is no way otherwise I would have agreed to drop this case. Therefore, please can you provide full details of why the case against xxxx was dropped. Why was I told by the PF that there was an issue with S.172 when there wasn't? Was xxxxxx absence allowed or did he break the terms of his summons? If so, has he been charged for this? The subject access request is a process by which a member of the public (i.e. me) can ask a body such as the PF to share any information they hold about that person (i.e. me). I therefore e-mailed the PF at the specific 'Subject Access Request' address and asked for information held about me, related to this particular case. I received an instant reply that I would hear in 40 calendar days or less. Some time later I received a reply in relation to my complaint. Here is a picture of the reply. So...The Procurator Fiscal was in error. Well, when you tell....and the following is my opinion I should stress....an untruth, a fabrication, a.....lie....then yes an error was made. A very serious error. An error of judgement that this fabrication would not be questioned. That someone, be it this particular PF or a colleague who suggested this course of action, made an error in deciding to deceive, because...... they were a bit busy that day and this was an easy case for them to get rid of. Is it possible that my opinion of what has happened here is is wrong? Is it possible that a genuine mistake was made? Is it possible that someone might accidentally think that the section 172 had an issue when it didn't? I seriously, seriously doubt it. Even the procurator fiscal here suggests that a decision was made, at some point which is uncertain (probably when the PF felt a bit busy and decided to chat with me...), that this case was not in the public interest. They imply that the decision was taken before the PF came to speak to me. If that was the case, if the PF really had decided that the case was not in the 'public's interest' why did the PF suggest the 172 problem? Why give me an option to proceed or not? The PF in the letter doesn't even refute my recollection of events. They appear to agree that that section 172 was mentioned. Let's take a trip to cloud cookoo land, and imagine that it was a genuine mistake. Even if that was the case...In what way was this case not in the public interest? Is it now reasonable to expect drivers swerving at you in (my opinion), obvious anger when you are riding a bike? That's just life, is it? Any why wait until the case comes to court, thus completely wasting my time? And I'm not really buying the whole, well, the defendant didn't have to show up excuse! Oh and notice, if I want to phone them to chat about this, I need to pay 7 pence per minute. Yes I need to pay them to discuss being lied to by them (in my opinion!). So what has come of the Subject Access Request?....I hear you ask. I have chased this and well,.....perhaps they will eventually get back, but I gave up waiting and decided to write this blog. I will continue to chase and when I eventually get the information I require and am entitled to, I will then use that information to complain further. Yes the PF is snowed under. Yes they are almost certainly understaffed. Yes I sympathise. But all sympathy from me was lost the minute....in my and perhaps your opinion....I was lied to. Who are they covering up for? Who was the driver? This stinks.